NB The Museum will be closing on 30 September 2015 in preparation for a move to a new site at the White House Cone. 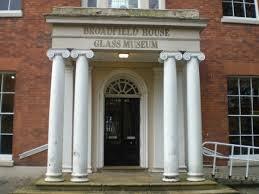 The Glass Museum has an extensive archive collection relating to the local and British glass industry, including items on loan from glass companies. It has a collection of pattern books, catalogues, description books, invoices and other paperwork, as well as photographs of factories, workers and their families. These archives include contemporary as well as historic material including the pattern books of Thomas Webb and Sons, and Royal Brierley Crystal which were acquired when those companies closed. It also includes pattern books from other local companies such as Richardson, Boulton & Mills, J. & J. Northwood, and Smart Brothers. Material is also held on individual artists including Daniel Pearce, Joseph Keller, and George and Thomas Woodall, as well as the Ravenhead designer Alexander Hardie Williamson. The Museum also owns the Glass Library, a specialist reference library of books, periodicals and auction catalogues relating to glass and the glass industry. This includes the entire library of Robert Charleston, former Head of Glass & Ceramics at the Victoria & Albert Museum and renowned glass expert (d1994). The Library is housed at Himley Hall and can be visited by appointment only: same telephone number as above.